Drama focus in Kindergarten are the perfect opportunity to introduce and practice using the three tools of drama: brain, body, and voice. Students are introduced to different elements of Drama through games, centers, and activities that emphasize the use of imagination. Drama focus in First Grade expand the use of the imagination and hone critical dramatic skills such as pantomime, vocal expression, and analyzing text. Drama focus in Second Grade looking at directing skill such as how space affects performances and also understanding how the use of costumes, props, and masks enhance dramatic play. 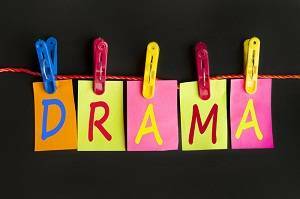 Drama focus in Third Grade expands on the idea of characterization as well as understanding the role of the actor in relation to the performance responsibilities, such as memorization, blocking, and characterization. Drama focus areas in Fourth Grade expands on the use of the improvisation in acting and looks at how theatre arts have affected, and are reflected in the culture, traditions, and history of North Carolina. Drama focus in Fifth Grade expands on the idea of characterization by looking at characters from different genres of given texts through the use of the body and voice as well as analyzing text and looking in depth and how theater arts plays a role in the history and traditions of the United States.